Scarlett Knight is one strange flower. I stumbled upon her name quite a few times in the early 1940s papers – touted as a promising starlet on her way to stardom, she fizzled like many of them, but it is the inspiring story of her post-Hollywood life that makes her an interesting subject for a short biography. Frances Knight Archibald was born in Louisville, Kentucky, in about 1918, to William David Archibald and his wife. It was a prestigious, rich family – her father was once a Kentucky state banking commissioner. Frances grew up in Kentucky and from any early age developed a special passion for horse riding – she was famous among her hometown for being able to guess a horse’s age by looking at his teeth and for her recopies for mint Jelups and Tom and Jerrys . Frances attended the University of Minnesota where she caught the acting bug and joined a stock company. She traveled through 33 states with the said company and played a variety of different roles. In 1940, Scarlett told herself that Hollywood is the next step in her career, and in two weeks she went from a stock company actress to a actress under studio contract. How did she do it? The enchanting southern belle, despite being labeled as a Myrna Loy look alike, did not give up and with a rarely seen determination managed to get signed by RKO. We fall quite short here. While Frances definitely was in Hollywood for a time, from 1940 to about 1943, and she was in the papers, I could not find any IMDB account for her and thus I have no information about the movies she appeared in. While there were plenty of actresses on the studio’s payroll who never saw the camera lens, and Scarlett could actually be one of them, I sincerely hope this is not the case and, by some accident, she does not have her page. If you trust the papers, she appeared in several movies in 1940 for sure. Anyway, wherever she appeared in movies or not, it did nothing to catapult her to stardom and she left Hollywood by 1942. When girls enter Hollywood they often fall into two basic categories: beauties who have little to no acting experience and use their looks as a starting point, or veteran theater actresses who have the experience and skill. It’s still a gamble and it’s very much unknown who will succeed or who will fail (While the second category has a bigger chance of success, there are truly no rules. Many world famous actresses started as chorus girls who used their looks to propel themselves to stardom – Joan Crawford, Jane Wyman, Norma Shearer. Many other top actresses were theater practitioners who just translated their thespian skills onto film – Katherine Hepburn, Bette Davis, Ruth Chatterton). By all accounts Scarlett, while not a Lynn Fontanne of her generation (in other words, a world known Broadway diva who did Shakespeare like it’s nobody’s business) she was a seasoned stock company player when she entered Hollywood, an experience that could have very well lent itself to her path to stardom. Yet, it did not, and Scarlett remains uncredited today. Yet she did sink her teeth into the Hollywood lifestyle and lived like many starlets of the time, gathering publicity for her exploits. She was a clotheshorse and posed for fashion columns. In early 1941, Scarlett injured her Achilles tendon and was bedridden and as a result, she had to skip a few roles. A few years ago during a visit to Hollywood I was privileged to meet and to be of some assistance to a beautiful young Louisville Ky girl with the startling nom de theater of Scarlett Knight. She had talent ability ambition and great beauty but she was getting no where fast in filmdom so with the aid of Abe Shore, manager of Max Factor Cosmetic Co and Harold Rodenbaugh former Tribune reporter who had be come photography editor of the Louisville Courier Journal I started a publicity campaign for the young lady. Her picture appeared in Life magazine and Harold went to town with n full page article complete with photographs in the magazine section of the Courier Journal. Theatrical agents began to take notice and when I next heard from her she was playing one of the principal feminine roles in the stage play Good Night Ladies which had a two year run at the Blackstone theater in Chicago. She dropped the Scarlett and was known as Francos Knight. Every Christmas she wouldd send me a card of appreciation and I could tell that success hadn’t gone to her head. Then I received an mail letter from Italy where she was with a M S O troupe entertaining our fighting men. Then a long silence and I wondered what happened to my young friend. Then the other day there came in my mail the following Mr and Mrs William David Archibald announce the marriage of their daughter Frances Knight to John Bayne Breckenridge, Lt Col Army of the United States, on Sunday, the twelfth of August 1945, in St Johns church, Broad Creek , Maryland. And so one chapter of the story ends and a more interesting one begins. May it and all the succeeding chapters be filled with joy and happiness. 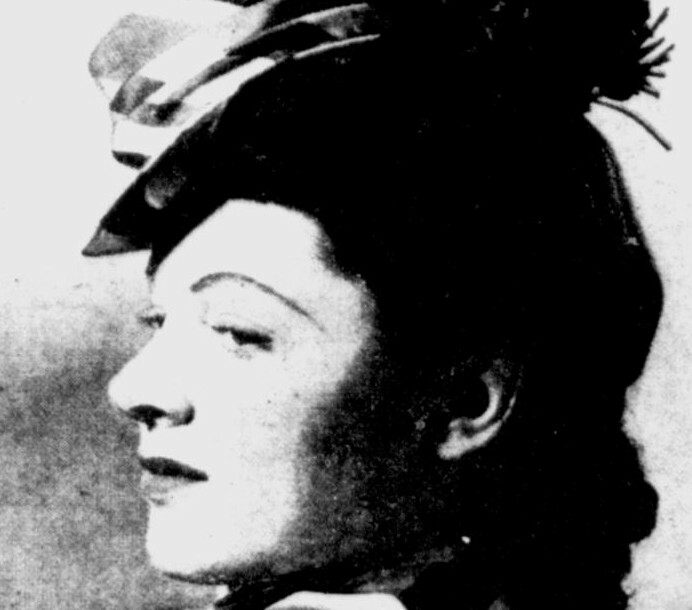 Thus, Frances married John Bayne Breckenridge in 1945 and gave up her acting career for marriage. Her transition from a starlet whose career went nowhere to a respected theater actress who met the love of her life while on a truly noble mission is very encouraging and shows how we can all reinvent ourselves anytime in life. The Knight-Breckenridge union resulted in two children, a daughter, Frances K., born on September 12, 1946, and a son, John B., born on May 5, 1949. Both of the children were born in Ketucky, so I imagine she and her husband lived there long term. I have no idea what happened to Scarlett afterwards, but I do hope she lived a happy life. Ellen Hall, unlike most of the girls featured here, has her own Wikipedia site! This is highly indicative of the fact that she had some minor success in the film industry despite being completely obscure today. Ellen Jeane Johnson was born on April 18, 1923, in Los Angeles, California, to Ella Hall and Emory Johnson. Her older brother Richard was born on January 27, 1919. her younger sister, Diana Marie, was born in October 27, 1929. She came from an acting family – both her parents and maternal grandmother, May Hall, were thespians. Yet, the only one who ever made true waves was her mother, Ella, a well known actress in the 1920s. Born in New York, she came to Hollywood in the early days of silent films. Her father was originally from San Francisco but left the city for Los Angeles pretty early, in 1913, to have his luck in the burgeoning film industry. Her mother retired from movies in 1933, and her parents divorced sometime in the 1930s. With her pedigree, it was not wonder that she started acting at a very tender age of seven. She made her movie debut in 1930, and started doing theater work very early, in about 1935. 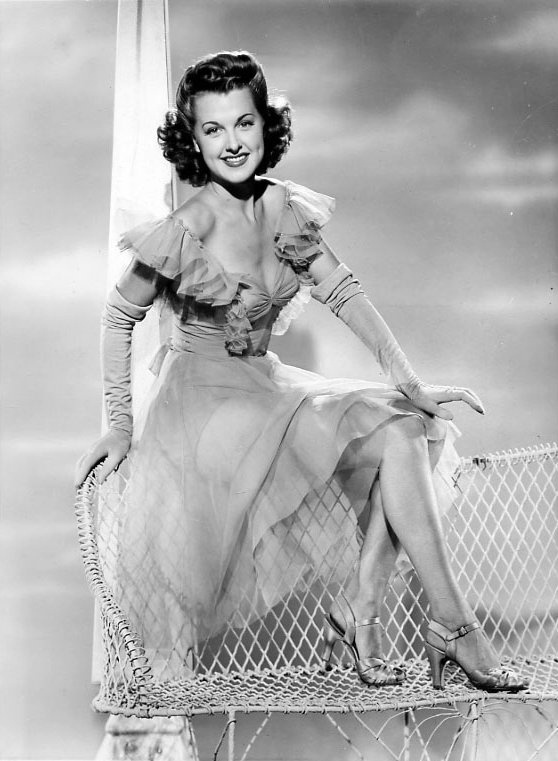 She migrated to New York in 1937 and had several theater roles on and off Broadway. In 1940, Ellen was living with her mother, brother sister and grandmother in Los Angeles and attending high school. Ella worked as a saleswoman to support the family. Her film career started in full that year, and some success awaited her. Ellen made her debut in an absolute classic, All Quiet on the Western Front, when she was just a 7 year old child. This is nothing unusual for offspring of thespians families, but what is unusual is that her mother decided upon a path of education for her instead of a child actress career. Ellen was already a seasoned theater player when she hit movies again, this time in 1941 at the age of 18. The movie was The Chocolate Soldier, a charming Nelson Eddy/Rise Stevens operetta. In 1943 Ellen finally came into her own. She was never to become a star, not an A class actress, but worked steadily in B class movies for more than 6 years from than on and achieved enough success to play leads. 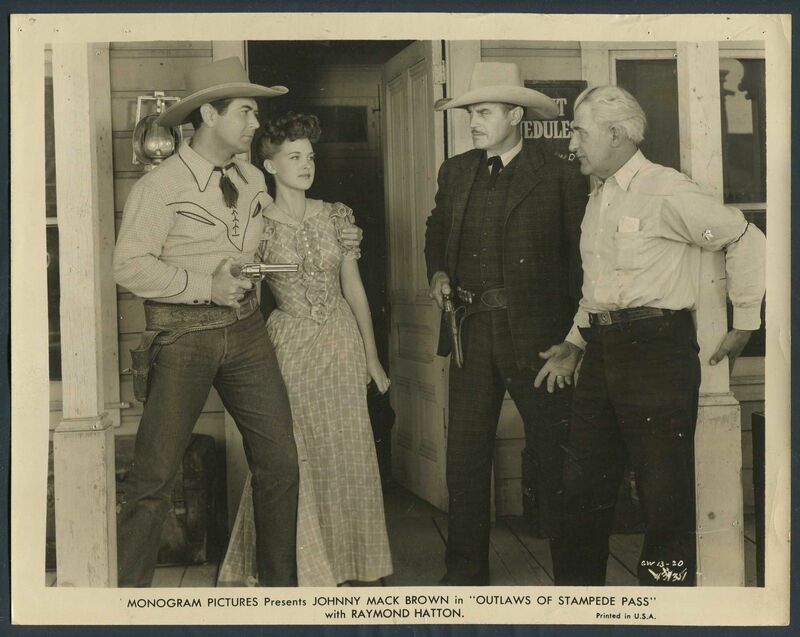 Her first lead was in Outlaws of Stampede Pass, a more than decent Johnny Mack Brown western. She continued the trend by appearing in the very next Mack western. Both times the played the female lead and the romantic interest, but they were not the same characters. Seems like Mack Brown was a James Bond before the first Bond movie was even made! Ellen made a foray into A class movies in Up in Arms, playing the Goldwyn girl, but it was back to B-s right after with Voodoo Man, a decent enough Monogram horror with a superb horror cast (Bela Lugosi, George Zucco, Lionel Barrymore). Ellen play the role of Lugosi’s wife, a woman dead for 22 years who he is trying to revive with the help of a voodoo priest. In a nutshell, she’s the reason everything happens in the movie, a pivotal point. Quite flattering, considering that other cuties like Louise Currie and Wanda McKay. It was back to westerns after that. Lumberjack, Range Law Call of the Rockies and Brand of the Devil are the four movies that constitute the pinnacle of Ellen’s career. 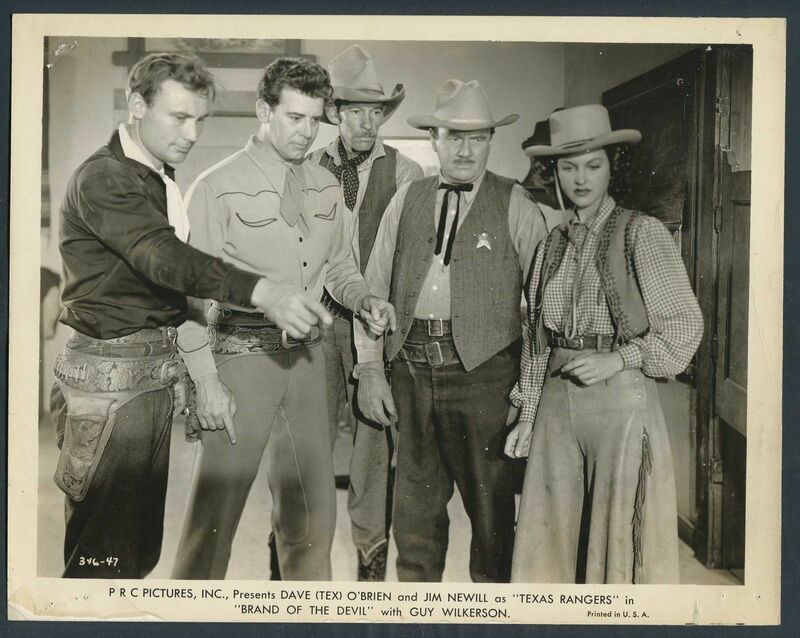 Always playing female leads in solid B class western series, and acting opposite some western heavyweights (Johnny Mack Brown again, William Boyd as Hopalong Cassidy, a character rarely surpassed in terms of popularity in the genre, and Smiley Burnette). While this was never the way to the A class, Ellen seemed content to being a working actress. After such a nice strike, Ellen was set aback to the uncredited tier in more prestigious movies, often a scanerio that happened to western heroines and B movie stars (kings in their tier, and paupers in the tier up). Here Come the Waves is a mediocre Bing Crosby/Betty Hutton musical. Definitely not a movie for those with any artistic or intellectual aspirations, it’s a piece of fluff that works due to the leads and their unique brand of charisma. Having Wonderful Crime, a Thin Man wannabe movie trying to mix sophisticated comedy with crime, falls short on several accounts, but is raised from total mediocrity by the ever charming Carole Landis. Ellen’s last big movie was Wonder Man, with Danny Kaye, where she was one of the Goldwyn Girls. Cinderella Jones, a below average romantic comedy did nothing for nobody, including the leads, Joan Leslie and Robert Alda. It was back to westerns and credited parts again. Thunder Town, one of the Bob Steele western movies, is unfortunately not among his best. While a very capable actor with an unique hard stare, Steele looks a bit worn out in the film and even the cameraman tried to “skip” any close ups. The next was Lawless Code, a western so deeply forgotten today it’s not even rated on IMDB, and the plot looks like one hot mess. Ellen evaded westerns for a short time with Bowery Battalion, a Bowery boys movie, and one of their more valiant efforts. While the low budget constrains have to leave their mark, the gags are good enough to make it a enjoyable experience. Ellen then had a few appearances in the well kn own western series The Cisco Kid, with Duncan Renaldo and Leo Carrillo. Her very last movie effort came in 1952 with The Congregation, a completely lost movie. Ellen mostly made the paper due to her acting skill and not really any publicity stunts. Her large acting family was always mentioned whenever she made the news, her mother being the most prominent star of the yesteryear. Ellen married Lee Langer on December 3, 1944, in Los Angeles, California, just as WW2 was ending (Lee attained the rank of captain). Langer was born on Ferbuary 3, 1919 in Illinois to Alex Langer and his wife, Sophia Rice. The couple lived first in Los Angeles, and them moved to San Diego. As far as I can tell, they had no children and Ellen enjoyed a quiet retirement. Langer died on February 24, 1995. Ellen moved to Washington state after his death. Ellen Jeane Langer died on March 24, 1999, in Bellevue, Washington.